Neutropenia is a dose limiting toxicity of chemotherapy. It results in delay and dose reduction both of which adversely affect outcomes of treatment. Myeloid growth factors are biological agents that stimulate the production go granulocytes and offset the myelosupressive effect of chemotherapy. Two myeloid growth factors are available Granulocytic colony stimulating factor (G-CSF) and granulocytic monocytic colony simulating factor (GM-CSF). This article will discuss G-CSF as it is used more often than GM-CSF. Commertially available G-CSF is made by recombinant DNA technology and may be produced in E. coli (Filgrastim) or chinese hamster ovary cell lines (lenograstim). The half life of filgrastim can be increased by covalently linking it to polyethylene glycol (PEG) and converting it to pegfilgrastim. G-CSF is a 174 amino acid peptide the gene for which is on chromosome 17. It has a molecular weight of 18kDa. It is produced by monocytes, macrophages, fibroblasts, endothelial cells and keratinocytes in response to inflammatory cytokines and bacterial endotoxin. 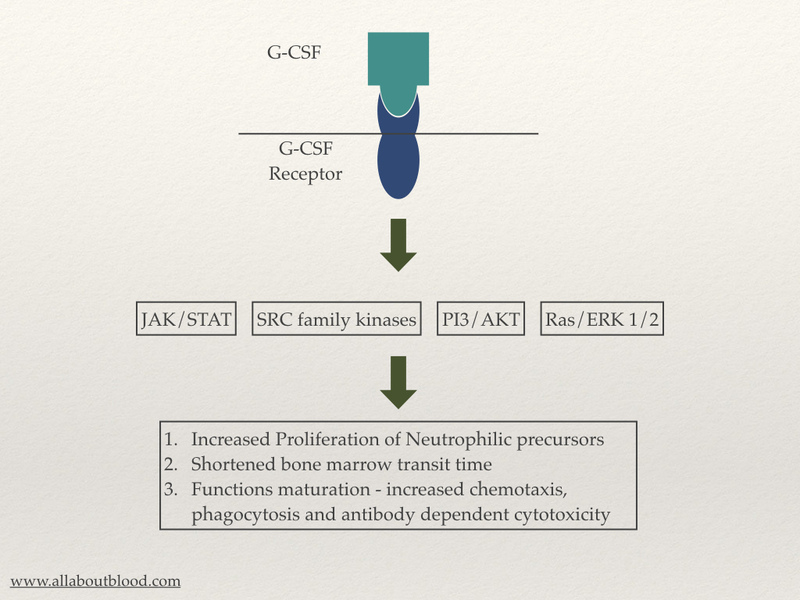 G-CSF acts via the G-CSF receptor. G-CSF receptor is a transmembrane receptor that form a homodimer on binding G-CSF. Activation of G-CSF receptor results in activations of JAK/STAT, SRC family of kinases, PI3/AKT and Ras/ERK 1/2. The details of the pathway are not completely understood. G-CSFs for clinical use is manufactured by recombinant DNA technology. Two molecules are available for clinical use. Filgrastim is produced using E. coli and lenograstim is obtained from Chinese hamster ovarian cells. Lenograstim is glycosylated (4% glycosylation). Filgrastim on subcutaneous administration filgrastim has a half life of 2.5-5.8 hours. The drug is eliminated by uptake be G-CSF receptors on neutrophils and glomerular filtration. Pegylation, that involves attaching a 20kDa polyethylene glycol (PEG) molecule to the N terminal eliminates renal elimination prolonging the half life to 27-47 hours. The product, pegfilgrastim, is only eliminated by binding to neutrophil G-CSF receptors, patients with low neutrophil counts have a lower clearance. Prevention of glomerular filtration allows administration of pegfilgrastim only once in a chemotherapy cycle. The discussion that follows applies to filgrastim and perfilgrastim as these drugs are used more commonly than lenograstim. The general principle apply to lenograstim but readers are advised to refer to information on lenograstim for details of use and adverse effects. Primary prevention of febrile neutropenia (FN) in patients with non-Myeloid malignancy on chemotherapy: Patients where on chemotherapy protocols that have a risk of febrile neutropenia equal to or greater than 20% should be administered G-CSF. Prevention of recurrence of febrile neutropenia: G-CFS may be used to prevent recurrence of febrile neutropenia in patients who have had an episode of infection in a previous chemotherapy cycle. Treatment of patients with febrile neutropenia: Initiating therapy with G-CSF after febrile neutropenia has set in has not been shown to decrease mortality of antibiotic use. It may however be used in patients who are at high risk of mortality. Use in patients with myeloid malignancies: There is an apprehension that G-CSF may stimulate leukaemia cells and G-CSF is not used in induction. It may however be used after induction to reduct the duration of neutropenia. Filgrastim is administered in a dose of 5μg/kg/day subcutaneously, by a short iv infusion or prolonged intravenous infection. therapy should be initiated at least 24 hours after the chemotherapy. The adult dose of pegfilgrastim is 6mg. The paediatric dose depends on the weight of the child. Children less than 10 kg: 0.1 mg/kg, those between 10 to 20 kg be administered 1.5 mg, between 21 to 30 kg be administered 2.5 mg and between 31 to 44 kg administered 4 mg. Children weighing 45kg or more should be administered the adult dose of 6 mg. Pegfilgrastim should not be administered less than 14 days after a cycle of chemotherapy. It should be administered more than 24 hours after a cycle of chemotherapy. Bone Pain: Bone pain is the commonest side effect with about 20-30% of the patients suffering the side effect.